The Celtic walled area on the Ringskopf (650m, today called Ringkopf) was built around 200 B.C. in the Latène Age (named after La Tène near the Lake of Neuchatel in Switzerland, where important finds have been made). The structure was up to 10 m deep and 2 m high, and supposedly served solely as a refuge for the local from the Celtic tribe of Treverians. This is in contrast to the much larger, better-fortified fortresses that were inhabited year round, like the ones found in Otzenhausen, Bundenbach or on Donnersberg mountain in Pfalz, where small settlements grew up behind the ramparts around the castle of the local ruler. Similar refuges are found, for example, on Alteburg mountain in Soonwald and on top of Wildenburger Kopf mountain near Kempfeld. Both the walled area on Ringskopf and the one on the top of Wildenburger Kopf mountain lie on the crest of Wildenburg Ridge only a few kilometres apart, separated by the deep incision of Idarbach creek, which cuts through the mountain ridge between Kirschweiler and Katzenloch. The easiest way up to Ringskopf is from Allenbach, where, easy forest paths, you can effortlessly reach the ample plateau on the summit. There are considerable remains of the original ring wall here, where it has been protected by its sheltered position. The wall consisted for the most part of high palisades constructed from logs, with the spaces between filled in with heavy pieces of stone. The entrance in the southeast of the enclosure and the corresponding access road were uncovered in 1935/1936 and are well preserved. The flat plateau of the summit boasts some particularly attractive scenery with its primeval group of trees and quartzite cliffs on the edge, which provides an extensive view of the countryside. Somewhat more difficult, although rewarded by a whole series of spectacular vantage points, is a climb from Katzenloch over the high, jagged rock formation of Kirschweiler Fortress on Silberich mountain (623m). Especially impressive here are views of the huge areas of slate and quartzite debris and scree near Katzenloch. Ringskopf is one of the stages on "Sirona Trail", which was created a few years ago. This trail is named after the Celtic goddess Sirona, the goddess of healing springs and the stars in the heavens, who was also known by the name Dirona (=star). Sirona Trail is a great hiking route which connects a number of ancient sites in Hunsrück and the Nahe Valley, documenting the cultural development of this region to the present day. 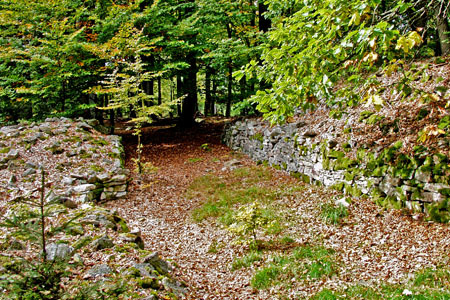 Divided into stages, this trail not only allows the hiker to gain insights into the life of the Celts and Romans 2,000 years ago, but, at the same time, gives an opportunity to experience the scenic beauty of the widely untouched nature of Soonwald, Idarwald, and Hochwald mountain ranges and to become acquainted with the warmth and hospitality of its inhabitants. Important stages on the Sirona Trail are the reconstructed Celtic "Altburg" Fortress near Bundenbach in Hahnenbach Valley, the prehistoric Menhir "King's Stone" (Königstein) near Rhaunen, the field of artificial mounds (prehistoric tombs) of Wickenrodt near Rhaunen, the ring wall / slag wall on Bremerberg mountain in the Nahe Valley near Kirn, the ring wall on "Regelsköpfchen" mountain near Fischbach in the Nahe Valley between Kirn and Idar-Oberstein, Wildenburg mountain near Kempfeld with the Celtic ring wall and Roman mountain temple, the walled area on Ringskopf, near Allenbach, the Gallic-Roman hill tomb in Siesbach, near Idar-Oberstein, the Pilgrimage Church Heiligenbösch, which was built on the foundations of a Roman villa, the ancient village of "Belginum" near Morbach, the gigantic ring wall area on Dollberg mountain near Otzenhausen, where the Celtic ruler Indutiomarus ruled at the time the Gallic Wars (58-54 B.C. ), playing an important role during the time of the Roman conquest under Caesar, as well as the fortified Celtic castle near Hoppstädten-Weiersbach south of Birkenfeld. Items from the sites at various stages of Sirona Trail can be viewed in the Birkenfeld Museum and in the "Vicus Belginum" museum in the Belginum Archaeological Park.